Wash Poha and drain water and keep it aside. Heat oil in a pan,add mustard seeds when it splutter add chana dal and cashew nuts and fry till golden brown. And add curry leaves, ginger and coarsely ground or finely chopped green chilli and finely chopped onions and saute for a minute. Then add finely chopped carrots and stir fry for 1 minute then add washed and finely chopped spinach and mix well. Then add the drained poha,turmeric powder, enough salt and mix everything well and lastly squeeze some lemon juice and mix well. 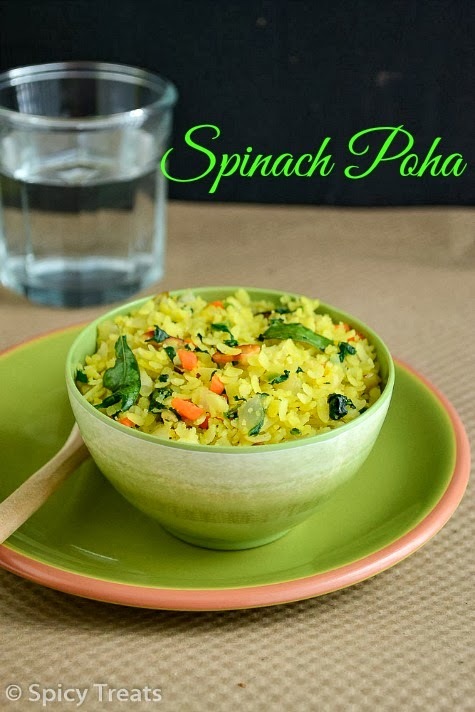 Healthy and yummy spinach poha upma is ready to serve. You can also use dry red chilli instead of green chillies. if you want very soft poha then after washing soak it with enough water for 2 minutes and then drain and use it in the recipe. Chop carrots finely so that it gets cooked but bit crunchy, no need to steam cook or microwave carrots. just stir frying is enough. The upma looks delicious I loved the idea of adding spinach to upma.Happy mothers day to you. 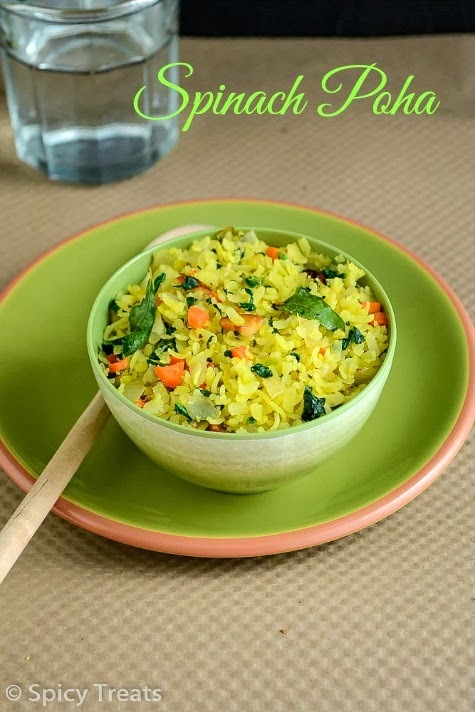 Lovely way to sneak in green veggies in the poha...absolutely wonderful recipe. Happy Mother's Day...enjoy a fun filled day with your kiddos. Healthy and yummy poha. Happy Mother's Day! Nice idea adding spinach! A very yummy dish for breakfast! Different one,looks tempting..must try it!! Happy Mother's day to you. 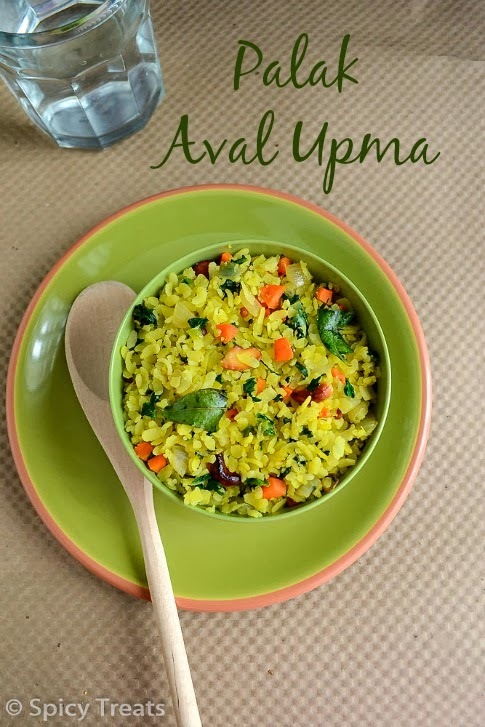 Delicious and colorful looking poha. wat an idea sangeeji...love the idea of adding spinach to it!!!!!!!! thats nice to add spinach to it.. healthy idea.. Delicious entry, light and tasty one for sure.